In my previous Hydronic Heating Coil Replacement post, Jim asked about more information on my heating system. I’ve finally had the opportunity to collect some of that information and try to crunch the numbers. 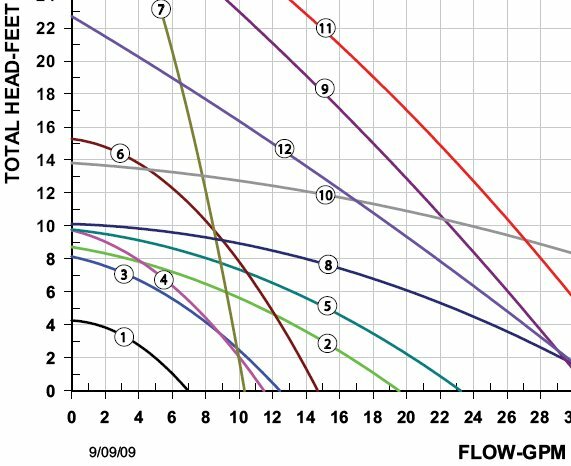 I can’t guarantee that any of what follows is correct – even after almost 5 years, I’m still learning about my heating system as it was installed by the previous owner of my house. My house is a 1½ story, approximately 1900 sq-ft of finished space and another 600 sq-ft of un-finished basement space. My source of hot water is a Polaris Natural Gas hot water tank, model PR-100-34-2NV. This is a 34 gallon tank that is capable of 100k input BTU per hour and 129 GPH recovery rise to 90°F. To pull the water from the tank through my hydronic heating coil, I have a Taco 006 Cartridge Circulator. It’s a rather cold day today so the system has been on a fair bit. This is good for getting ballpark temperature readings. For all of my temperatures, I’m using a Mastercraft Digital Temperature Reader which happened to be on super sale last week. It’s supposedly accurate within ±2°F at room temperature. You do have to keep the reader as close as possible to the subject though or you will get poor results. I tried to keep within 1 inch at all times. The output air temperature is 100°F (37.8°C) at one of my main floor forced air registers. This is probably the most direct run in the house and was also the hottest of the few I checked. In the basement I took a few readings at different points in the system. 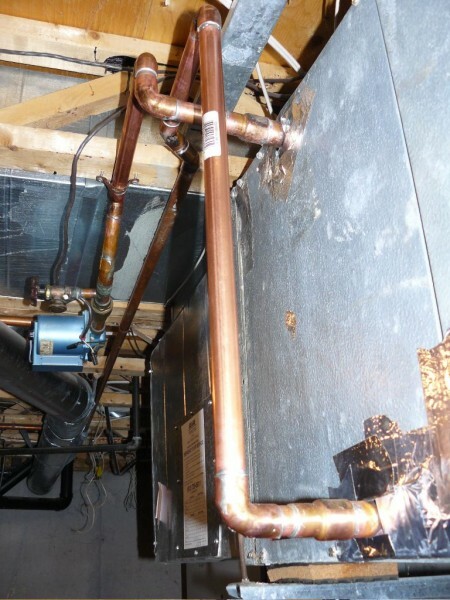 Now, all of the copper pipe used in the system is ¾ inch and it appears that the heat does not transfer quite as much. The Polaris hot water tank is set to 60°C (140°F). At the hot water tank outlet, the copper surface temperature is 120°F (48.9°C). Just before the Taco 006 circulator pump, the copper is 100°F (37.8°C). The circulator pump itself has a surface temperature of 160°F (71.1°C) (!). Just before the hydronic heating coil in the plenum, the surface temperature of the ¾ inch copper pipe is 85°F (29.4°C) and after going through the coil the output is 81°F (27.2°C). The hot water tank inlet is 90°F (32.2°C). This is all in my unfinished basement area where the ambient temperature is 64°F (17.8°C). Based on the data sheet (and the graph shown above) the Taco 006 Circulator is moving between 7 and 8 GPM in my installation (4 foot lift from the tank outlet to the ceiling where the forced air unit is mounted). The 006 is represented by the blue curve with the number 3. This would suggest that there is a 30°F (16.7°C) drop in the water temperature. Unfortunately, that’s really just a SWAG because measuring the copper surface temperature is not going to be a linear delta to the water temperature. Oh, and I’m really not sure why the Taco 006 circulator had a surface temperature of 160°F. It does feel quite hot to the touch but it shouldn’t be more than the 140°F water going through it. Maybe the surface is too shiny for the temperature reader to get a correct value. This entry was posted in General, Review, Technology and tagged Canadian Tire, energy saving, heat exchanger, heating coil, hydronic coil, hydronic heating, polaris on 2010/01/02 by Jeff Ivany. Almost a year ago I did a hydronic heating coil replacement on our heating system as the original heating coil had developed leaks. I’m happy to say that the heating coil is still working fine and there are no leaks! I’m rather amazed at my simple plumbing skills as I had never done any copper soldering work before. My parents were nice enough to give me a fantastic new self igniting MAPP gas torch at Christmas. Now I’m all set to tackle the next plumbing job – proper heat traps on the hot water tank. That project should help keep the cold water in our cold taps from being hot! Since installing the new coil, we’ve done some tweaking of our forced air system to try and address issues we had with heating. We now have it balanced reasonably well with all rooms getting a decent amount of heat. The only thing I’m considering is upgrading the blower to a more powerful unit to try and move the air a little better to the farthest reaches of the house. Our long runs to upstairs are still not quite getting enough air flow. It’s not a huge difference but if the doors are left closed for too long it becomes noticeable. This entry was posted in General, Kemptville and tagged energy saving, heat exchanger, heating coil, hydronic coil on 2009/01/22 by Jeff Ivany.